After playing on Cuba’s famous Varadero beaches, many visitors seek out the beauty of Cayo Coco. 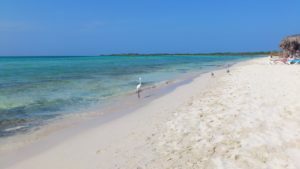 This is the country’s fourth largest island situated in the Archipelago de Sabana-Camaguey, also known to the traveling community as the Jardines del Rey. When you look at the number of tourists visiting Cayo Coco today, it is hard to imagine that the island was once mostly an empty mangrove swamp and now an “engineered” tourist haven. But what has always remained in this isolated area, is the series of gorgeous sandy beaches that made Cayo Coco world famous with private island feel and charm. Book lovers first heard of the island when it was mentioned in best-selling Hemingway novels, Islands in the Stream and the Old Man and the Sea. Cayo Coco is conveniently connected to the mainland through a causeway that stretches to 27 kilometers and goes through the Bahia de Perros (Bay of Dogs). The island is also connected by causeways to its neighbors, Cayo Romano and Cayo Guillermo. Cayo Guillermo, in particular, is home to Playa Pilar, often referred to as one of the most beautiful beaches in the world. Despite the presence of causeways, most of the visitors to Cayo Coco usually come here by air. As mentioned, there are many magnificent beaches to choose from while you’re in Cayo Coco. Most of these stretches feature white sand and stunning aquamarine waters. One of the most popular of this bunch is the Playa Los Flamencos, sitting on the Atlantic side of the island. This beach features sun-bleached sand that stretches to an impressive 5 kilometers. But if you prefer a beach that is more tranquil and has little development, then seek out the beach called Playa Prohibidad. Aside from swimming and sunbathing, you can explore the nature trail near this beach. El Baba Nature Park is another one of Cayo Coco’s prime attractions. This nature reserve covers a reclaimed land that encompasses a little more than 1,800 acres. It attracts visitors with its collection of wildlife including crocodiles, turtles, and various species of birds making El Baba a notable destination for those who enjoy bird watching. 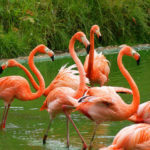 One bird species that you will definitely encounter is the pink flamingo. In fact, the whole island is home to one of the big biggest colonies of pink flamingoes in the world. Snorkeling and scuba diving are also favored activities on the island as there is a massive coral reef system just offshore just waiting to be explored. Like other resort towns in Cuba, Cayo Coco is home to a slew of grand all-inclusive resorts that are located right near the beaches. But beside these resorts, the island does not have much in the way of extensive modern infrastructure. So just being here gives you the feeling that you are away from it all. Resorts provide various entertainment especially at night. But if you want to really party till the break of dawn at a truly exotic and unique location, head out to The Bat Cave nightclub. 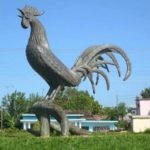 If you don’t want to spend the entire day at the resorts, arrange for tours in various places of interest like the provincial capital of Ciego de Avila and bustling Moron, home to the town’s cockerel bronze statue. Visiting these places will give you an idea of the local culture and lifestyle on Cayo Coco. For a reference map of Cuba, go Here.